Instructions for use: Remove shell before eating. Ingredients: Sunflower Seeds, Granulated Sugar, Salt, Brown Sugar, Food Additives (Sodium Cyclamate, Acesulfame-K, Saccharin Sodium, Sucralose, Flavour, Ditert-butylhydro Quinone). 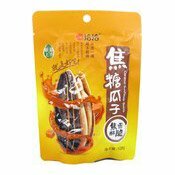 Simply enter your details below and we will send you an e-mail when “Caramel Sunflower Seeds (洽洽焦糖瓜子)” is back in stock!